Prudence, a cuddly owl, doubles as a take-along pillow with a blankey tucked under her wings, for car trips or a visit to grandma's house. 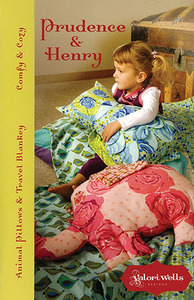 Henry, the elephant pillow, is Prudence's friend, and has a blankey of his own. The blankey is perfect for napping in the car or at home on a Saturday afternoon. Each is personalized in colorful, cozy flannel and can be made for a girl or boy. Prudence the Owl: 20" tall; Henry the Elephant: 17" tall; Kids' Nap Blankey: 41" x 58"